The difference between too little and enough is obvious. Too little hurts; enough feels satisfying. More than enough can be a feast, and a feast is an experience of abundance! But if there is always more than enough, the feast becomes meaningless. It becomes too much or overindulgence. How do we learn what is enough? So, how do we learn about how much is enough? I never saw a college class labeled Enough 101. Or a high school option (and it would be an option, wouldn’t it?) called Learn About Enough. We didn’t have Tuesday morning modules on Enough in grade school. So, how do we learn? Enough is one of those concepts that is taught informally, when the occasion arises, often outside of awareness. Ask ten different people how they learned about Enough and you will probably get nine blank stares and one story about the discomfort of a time when having had way too much was distressing. This is a very debilitating situation. One interviewee stated plaintively that she hopes before she goes to her grave that she has one afternoon when she knows what is enough of just one thing. Anything. This is not the impact parents plan to have on their children’s lives. But it is a result of having had too much. 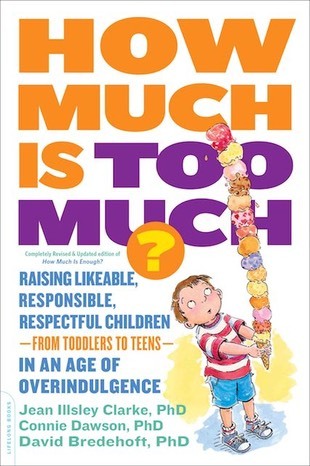 In part, the concept of Enough is learned, and one that parents teach as children grow. At times, it is easy to let a child have too much in order to avoid dealing with the child’s frustration. But teach about Enough we must. So, in the car on the way to the toy store we say, “You may choose one toy today. I will decide if the price is right and if you may have it.” When our child begs for another, we say matter-of-factly, “You already have your toy. That is enough. If you continue to beg we will put this one back.” And if that happens, we carry through. Lucky is the child whose parent is not swayed by tears, begging, pouting, or shouting. Sometimes this is hard for parents to do. The media and other people are constantly telling your child she will be more okay if she has more and newer. But parents need to be in charge of the family. If it’s hard for you, you can practice the following. In front of a mirror, practice saying no without looking mad or scared or guilty. Find a firm look, not critical, but with no smile or laughter. Smiles encourage children to continue misbehaving. Make lists of things your child wants or you want to give and then you decide what is too little, enough, abundance, or too much. Give enough always in so far as you can, give abundance sometimes. Remember that too much is not better than abundance. It is worse. Much worse.